Each of the 44 families were given 60 perches of lands in 1965 by the Assisting Government Agent of Ko’ra’laip-pattu North at that time. The December 2004 Tsunami devastated the coastal village destroying everything they owned. The families were provided temporary shelter at a different place within the GS division of Ooriyan-kaddu. Later, they settled back in their coastal village. However, war broke out in 2006 and the people of entire Vaakarai became uprooted. When they were allowed to return to Vaakarai in February 2007, the lands of 44 families had been completely occupied by the 233 Brigade of the SLA. 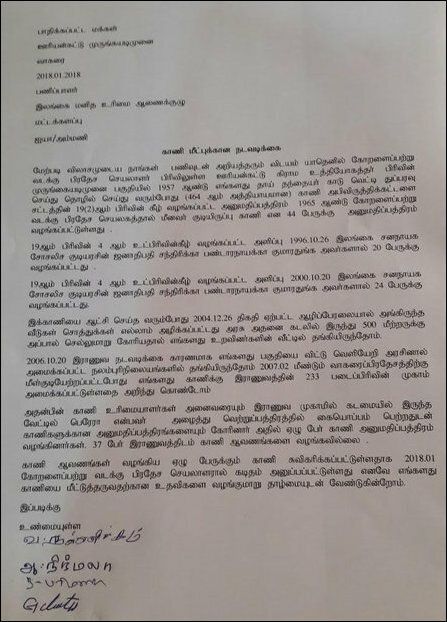 S. Lohitharajah, the acquiring officer at the District Secretariat of Batticaloa sent a letter to the families in on 06 June 2013 claiming that their lands were being taken over by the SL State under the SL constitutional clause of ‘public purpose’. The letter came as a shock to the people, who had been fighting since 2008 to retrieve their lands back. The SL authorities were trying to justify the military take-over of private lands under the clause of ‘public purpose’ as specified in the Section 2 of the Land Acquisition Act of 1964. But, the ‘public purpose’ of using that particular area was not properly established and cannot be justified under any circumstances, even according to the SL Constitution, the villagers say. Further, even to seize the lands under the public purpose clause, proper procedures must be followed. The owners should have been informed in advance. These procedures have not been followed, a lawyer preparing to take up their case told TamilNet.